Challenge #9: If stranded on a deserted island, and could only bring one music album with you, which would it be? What is it about this music that never gets old for you? My favorite music album changes as I age. Every time I think I have found the definitive album that matches me so perfectly, I hear something else that blows my mind away. When I was young and single and fresh out of high school, the ABOVE THE RIM Soundtrack would have been the album for me. Why would anyone pass up SWV, H-Town, 2Pac, and Tha Dogg Pound? Now, I still enjoy that particular album but my taste in music continues to evolve. Back in 1998/1999 era, I would have said that KIRK FRANKLIN and any kind of gospel music was "it" for me. But as I stated before, my taste in music continues to change. Probably the best thing I could do is make a play list of some of my absolute MUST HAVE songs because just one album would not do it for me. 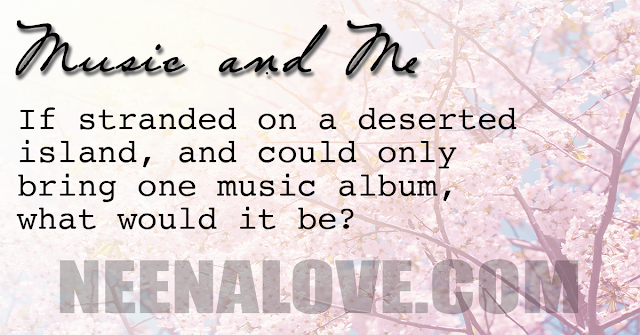 Song #2: My parents are fans of Country-Western music. As a little girl, my father would put in his Glen Campbell 8-Track and we'd cruise down Kamehameha Highway, aboard our white impala (sixth generation) with red vinyl top and red interior. I can still remember singing, "..There's been a load of compromisin'/ On the road to my horizon/ But I'm gonna be where the lights are shinin' on me/ Like a rhinestone cowboy/ Riding out on a horse in a star-spangled rodeo..." Any Glen Campbell song will remind me of my father. But the one that makes me miss him even when he's right next to me is Wichita Lineman. I have to give it to country-music, the lyrics often tell a story that is not based solely on lascivious desire as is the case with some rap, some hip-hop, and some R&B. So song #2 is definitely WICHITA LINEMAN. Song #3... comes from one of my favorite movies of all time. The Mirror Has Two Faces starring Barbra Streisand has the title song "I Finally Found Someone". That is a definite favorite. And if I'm imagining that I'm on a deserted island then I would want this song handy to remind me of this movie and what my life was like when I first seen it. The movie came out in 1996. I didn't see it until probably 2001 or 2002... the ex and I were separated. I was feeling very, very low -- doubting my reflection. Why didn't he love me? Am I unloveable? I went through a myriad of emotions mostly pointing to me feeling sorry for myself. The movie portrays Barbra as a frumpy single lady who marries the handsomest professor for all the wrong reasons... just for the sake of being married. HMMMM... sounded so much like my life at the time. To find out what happens... well... you have to watch the movie! SONG #3: I FINALLY FOUND SOMEONE. Song #4 is an unlikely choice that ties into Song #3. It was another song that was featured on The Mirror Has Two Faces in a roundabout way. The song -- Nessun Dorma as performed by Pavarotti. As a child, I did not have access to things like ballet or opera so hearing this song was such an experience. I don't even know what the song is talking about but it comes from the opera Turandot. It is magnificent! Song #5 ... this song OFTEN makes me feel homesick for somewhere beyond this earth. I don't know if folks can connect with that. I wrote about it before on here. It stimulates weird emotions... not weird meaning bad but like weird meaning new emotions and experiences. The song is by Christopher Cross, SAILING. The vibrations of this song is at the right level to reduce me to tears -- homesick. Song #6 ... going in a totally different direction, one of the greatest rock songs for me comes from the classic late 80's rock band Guns-and-Roses. WELCOME TO THE JUNGLE. I love that song. I love Axel Rose. Not only is it a pumping, up beat song but it appears on the movie Lean On Me.... great memories. Song #7 ...a rap classic PAID IN FULL by Eric B. and Rakim. The bass line and sound bytes are representative of the era of Yo! MTV Raps (at least for me, it is). I remember first hearing that song and seeing that video. I was/ am hooked. Current "pop hip hop" artists can't even touch the lyrical skills of old school rap masters like Rakim. His distinct voice coupled with his delivery and poetry -- no one can duplicate it. The quality of his voice is probably my favorite even to this day. (I like Dr Dre's voice also.) East Coast style rap was king before NWA hit the scene and when they did -- it was up in the air who ruled the rap waves. Song #8 ...I NEED LOVE. L.L. Cool J was, in my opinion, the finest man I had ever seen when I was 12. I always imagined that he was rapping right to me when he did this song. I used to write down the lyrics over and over in my journal. Til this day, I can still rap the entire song. Goodness, it's been over 20 years. I amaze myself. Song #9 ... SEPTEMBER by Earth Wind and Fire. That song makes me feel happy. I can just see myself waking up to this song if I were deserted on an island. It wakes me up and makes me feel a little nostalgic.... wishing for the carefree innocence of childhood. Song #10 ...CLAIR DE LUNE composed by Claude Debussy and performed by 101 Strings Orchestra. This is my most favorite classical piece of all time. It appears in a couple of Hollywood movies. Think of the end scene of Oceans 11, outside of The Bellagio, the water dances to this tune. It's used in Twilight. I've heard it was cut from a crane scene in the 1940 Disney Classic, Fantasia. I just love the good vibes I get from this song. The thought of being on a deserted island makes me think of the piano or the stringed instruments I will not hear for awhile. I think that's a pretty good playlist for now. I have eclectic taste in music. What can I say?